Ensure optimum cleaning in your kitchen with this San Jamar KP196RD 6 qt. red Kleen-Pail. Adhere to HACCP guidelines for cleaning and sanitizing cloths with this collection's color-coding, including red pails for sanitizing solutions and green (sold separately) for cleaning solutions. Plus, "sanitizer" is printed on the pail's rim in embossed text, ensuring health inspectors can always identify the bucket's purpose. This text will remain even if the white text rubs off after repeated use. Number one these are a requirement and two, they do exactly what they should. I don’t have a single concern with these. We own over 7. I've been in numerous kitchens that don't color code their soap, water, and sanitizer. I hate trying to guess sometimes. Thankfully this takes guessing out of the occasion. Perfect for sanitizing buckets as required by local health department in my state. I have multiple kleen pails and it is a great product that lasts and is easy to clean. Purchased item to replace just generic buckets used for sanitizer. These buckets hold up well. The only issue that after repeated use the screen printing on the front starts to chip off or fade. Overall it has held up to day in and day out abuse. We keep these at each of our stations for sanitizer water. We use the larger sanitizer pail to make a big bag and then refill these throughout the day to ensure that it's easy for our employees to keep the solution rotated. What would we do without these great buckets?! Sturdy, handle stays intact, easy to clean, and easy to see, you'll never lose them. We've got a few! Perfect medium sized sani bucket for use around small prep areas. The color tells everyone what the bucket is used for. Cleans up in the dishwasher just fine. I use this pail with my pre-treated sanitizer wipes because you need a gallon of water per rag. This one works great because it leaves some head space. build well. This Sanitizing bucket is perfect for any restaurant, the size allows for at least two towels. The letters wear off with age but the surface is easy to keep clean day by day. The color stands out for new employees to find an important part of the work area. Great Product for a great price. Have had these for quite some time and they still look great! Easy to clean and health inspector approved. Durable handle. We have several of these red sanitizing pails in our building. They work great and are a good quality pail. Nothing fancy but they don't need to be. It works well. You can't have to many sanitizer buckets They are always good to have on hand whenever you need to get cleaning and sanitation task done. They haven't broke like the ones they sell at another site... San Jamar usually has quality stuff that doesn't break. Plastic can be made great! We love these sanitizer buckets because of their size and their bright red color. Whether it is our employees or the health inspector, they are quick and easy to identify. These are nice buckets. heavy duty. They look nice and are very affordable. I would recommend this product to any one in need of a sanitizer bucket. These buckets easily distinguish the sanitizer for the kitchen. We use them in the public areas too and they are a nice middle of the road size. perfect mini sanitizer buckets, easy to carry with the handle. very sturdy and holds just the right amount of water and one or two towels in it. will order again. These sanitizing pails are perfect for food service operations. The color, labels and measurement lines inside the pail allow for easy distinction between pails and their contents and allows for ease of dilution of chemical with knowing exactly the amount of water you have put in. The handle provides for easy carrying from one location to the next. These are durable and last. I have been with this operation for going on 3 years now and this is the first time I personally have had to replace a pale. Well worth the price! I absolutely love these Sanitizing buckets and the other coordinating colors. The buckets keep my students aware of and using proper sanitation procedures in the classroom. When they enter the workforce, my local employers are impressed with the student's ability to follow sanitation procedures. LOVE, LOVE, LOVE! These buckets are exactly what our local health inspector wants to see in our restaurant. They are marked for you and color coded. I purchased all three colors. It eliminates confusion by our employees also. They are a little bigger than needed for our purposes...but work just fine. Every restaurant operation knows these are essential! Durable, perfect size for sanitary stations and the health department approves. These are a staple and well worth the price. The San Jamar Sanitizing buckets are perfect for keeping sanitizer solution in around the restaurant. We keep two in the kitchen, one behind the bar, and one at the waitress station in the dining room. Good quality handles, and heavy duty plastic. I really like the size of this pail. I replaced my larger pails with these and I appreciate the increase in shelf space and I don't need the extra pail capacity. Perfect for holding our sanitizer solution made with the sanitizer tabs. The health department loved seeing these, color coded so they could easily tell the sanitizer apart from the other cleaning solutions! This is a great bucket for sanitizing formula! It is pretty big so that what most of you will definitely appreciate. Quality is great a price is even better! clearly you can use these buckets for anything, but they're most commonly used for sanitizer in most restaurants, hence the colloquial name "sani-bucket". they are made well and hold up to a lot of use and things like chemicals/hot water. These 6 quart cleaning pails from San Jamar are perfect for restaurants, bars or cafes looking for an all purpose pail. These are color coded with red being labeled as "sanitizer." Other colors are also available. Very handy to have these around the kitchen and food truck. The red color and writing on the sizes help our staff with locating the sani bucket and making sure only sanitize is going on the inside. 6 quarts is plenty of sanitize to use throughout a shift or at a work station and not run short. Good bucket to identify from dirty bucket and a sanitizing bucket. Been using this product for almost a year now and do not have any issues with it. Great value. It does what It should. I bought different color to separate their duty and separate between each team. The measurement scale inside work very well for beginner. this bucket does what it is designed to do. passed health dept requirements and good size for holding one or two towels at a time. Best price for purchasing sanitizing buckets, a must for any commercial kitchen. Sturdy plastic. We keep one at each work bench and re-fill after every 4 hours to maintain good sanitation practices. Perfect size for use with sanitizer tablets. We fill up 4 quarts per one tablet and have plenty of room to spare for ringing out towels. Durable and lettering on the bucket has not faded with use. This bucket is pretty sturdy. I don't get why the health department would recommend getting this when I can probably find something similar elsewhere. But hey, it works great. We use it to sanitize about 6 towels at a time during store operations. We bought these as they were recommended by our health department for the color coded red Sani buckets, Red for sanitizer solution. Would buy it again. Very good product for business use, for my shop it's the right size fits 4- 6 clothes depending on their size. Sturdy handle for everyday use. Serves its purpose almost perfectly. Construction, including handle, are very durable. Only issue is that the printing on the side comes off way too easily and quickly. It's a good thing the color coding is standard in the industry and helps signify what it is for. San Jamar KP196RD 6 Qt. Red Sanitizing Kleen-Pail is a great little pail. I realized I was not using my Sanitizer properly in the larger pail. This 6 Qt. Red Sanitizing Kleen-Pail have a color that will help you to don't contaminate the places. can contain 3x32oz and 1x16oz bottle spray. This is our favorite size sani bucket for the front of the house areas - by the patio, by the bar, by the server area & bussing area. 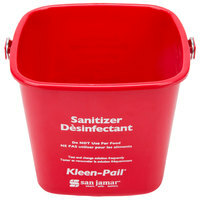 This san jamar 6 quart red sanitizing kleen-pail is to be used for sanitizer liquid only. It is larger than the familiar 3 quart sized bucket. These sanitize buckets work amazing in our chocolate shop.. They are durable and easy to place under our counters. Also keeps in compliance with health codes. This is a wonderful and durable sanitizer bucket they hold up very well and have lasted me a very long time. I would recommend this product to anyone. These buckets are very handy! No more taking up table space if you purchase the wall mount for these! Gotta get them. They are great! We use this everyday in our business. It is sturdy, well-designed and can be seen at a distance because it is red. I highly recommend this pail. This San Jamar Kleen Pail is great any sanitation solution. This pail also meets Health Department standards. I always use a green (for detergent) and red (for sanitizer) kleen pail. The San Jamar Sanitizing pail is very sturdy and durable. Very thick and pretty heavy. Holds up to a lot of use. We will reorder these as needed. The 6qt. Red Sanitizing Pail is perfect for sanitizing towels to clean tables and surfaces in the kitchen. No more getting the buckets mixed up with this bright and long-lasting color. The words will chip off after a while. It's the same San Jamar pail that you get everywhere else; just a bit less expensive with the same reliability. Gotta love Webstaurantstore's pricing on most items! Great because it's labeled and color coded. Good size, perfect for cleaning large area. Can definitely recommend this for general purpose cleaning. Good product. I personally prefer the larger size. Exactly what you need. Sturdy and dependable. Bought multiple sizes of these for sanitizing towels and silverware. Definitely will buy again if we need more. You just can't beat these. They're colored and printed so everyone knows what they're for, the price is very reasonable, and they come in multiple sizes to fit in a number of places around your kitchen. We love these buckets. They make training staff simple and make our health inspectors happy. Definitely a great price for the product and worth having! Red is definitely a color that stands out in a professional kitchen. So it is great to have color coded buckets like these around, so you can use sanitizer only in that vessel. In restaurants in Brazil they are not mandatory, but even not having the text in portuguese, it is very straight forward and everyone understands. This particular 6 qt size is very handy and as they worked very well I will need to order some more. I love this bucket. It's red so everyone knows it's purpose and there are no questions. It's the perfect size and is great at the server station for wiping tables. The Health Department will be checking for these Red Sanitizer buckets during your next inspection. They are brightly colored so they are easy to see and their compact size make them easy to store. Handle is convenient for transport. We use two different colors of sanitizing buckets so that they can be kept separate. I can't remember the last time we had to replace them. They are really sturdy little buckets. First thing I can say was the communication on my order was outstanding. There was a deal with these pails, where if you ordered 12 or more, the price dropped. Seeing as I run a full service restaurant, that was a no brainer. I immediately received my confirmation email no problem. The next day, I was notified that Webtaurantstore was out of stock, but attempting to contact the supplier to have them sent directly to us. The following day, another confirmation email advising that the product was approved and will be shipped directly from San Jamar! They arrived and were exactly what I was looking for. Not too big or too small. Holds a nice amount of sanitizer and is easily read/labeled (for those health inspector's ease of mind). Overall, very satisfied with the service provided and will be ordering again soon! Sturdy and well-priced make these any easy choice for a sanitizer bucket. Clearly labeled to prevent accidental misuse of chemicals. They are strong and last a long time and can survive the occasional fall on the floor. Perfect price. Makes the food health inspector Happy & Merry. Keep food inspector happy and your score will be great ! Just follow rules and keep everything super clean. The San Jamar red 6 qt sanitizing pail is a must have and the health inspectors will let you know that. Perfect size and at a very good price. What can I say, these are good quality sanitizing pails to use for your food service business. The material is flexible so it won't crack quickly from constant handling. Sanitizer buckets are great for keeping the kitchen, counters, table tops clean and sanitized. Health inspectors will check these. They are the right size and they are cheap. Every kitchen should have a few of these Kleen Sanitizing pails on hand. They are perfect for keeping work areas sanitized and prevent food contamination. These sanitizing buckets are required for putting rags in. They are well priced here and come quickly. I also use the smaller ones in our facility. does what it needs to do. marking lines on the inside so employees can be sure to have the proper water level for the addition of sanitizer tabs. this makes proper dillution easy to maintain. less testing needed, less strips to buy! the handle is convenient as well. These pails are pretty small, so they are easy to store and carry. They are also inexpensive. I am glad we bought our sanitizing pails from the Webstaurant store! In our restaurant we are using these pails to keep all of our towels sanitized. We are working on keeping our restaurant very clean, and these buckets have been of great help! Very good pail for holding sanitizer and also a handy size to make it versatile for other uses. The handle is well made and makes it easy to carry. This little sanitation bucket has done its job and no cracks. Health Department loves seeing it out and in use correctly. It is a must to organize your kitchen correctly. A little smaller than I thought, but a useful bucket otherwise. Great size for a sanitizing bucket for dish towels. Next time I will order a bigger one for heavier jobs. Plastic buckets of different colors are essential for effective, consistent food safety practices. We use the red buckets for sanitation solution and they get the heaviest use in the kitchen. Over time with many washes, the writing starts to fade, but otherwise the buckets hold up very well. If you are going to have health inspections you are going to need these buckets for your operation. They are exactly what I need to keep my kitchen clean and health department compliant. This is a great sanitizing pail. The different colors make it easy to distinguish between sanitizer solution and soap or other cleaning products you may use. Great sanitizing bucket! Works wonders to keep a clean and sanitized work station! Colored pails allow easy recognition of which bucket to use for sanitizing and which one for cleaning! Great Value!!! The color-coded bucket makes cleaning and sanitizing a snap. The bucket holds 1 1/2 gallons, doesn't tip easily, and they are stackable. Ease of use? Perfect. You can't get away without these when it comes to keeping your store clean and sanitized. We use them all over our store and they are a great price. This little red sanitizing pail from San Jamar is exactly what I expected. Nice, heavy-duty pail that is small - holds 6 quarts of water or cleaner, perfect for any employee to carry around for quick clean-ups.